Famously known as Mt. Everest, Sagarmatha and Chomolongma this world’s tallest mountain is everybody’s dream destination for ultimate adventure in life. Conquering and being at summit might be a herculean task but reaching its foothill might fulfill the desires of placing your footprints on such iconic place. Mountain Path Treks is delighted to offer enigmatic journey ever in your life via Everest Base Camp Trekking. Come and fulfill your wilderness adventure dream and quench the hunger of seeing Mt. Everest as close as you get. Trekking in Nepal at Khumbu region ignites momentous tale in your heart which you can share for generations to come. Everest Base Camp Trekking in Nepal is the most prolific trip among outdoor adventure trips. It starts with the joyous flight to world’s extreme airport in Lukla. The views of mountains as seen from flight starts to breeze the chill mountain air once you start your trekking towards Phakding as first day’s trip. 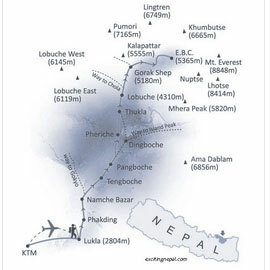 The next day’s trip is towards the hub of Sherpa people. Once you cross the famous Larpchen Bridge the uphill trekking through lush green forests provides the first view of Mt. Everest (8848 m). Acclimatization hiking to the Everest View Hotel takes place the next day. This is highly recommended task as it make trekkers to get acquainted with the high altitude. The view of mountains is panoramic from the hotel as you can see Everest, Nuptse, Lhotse, Tabuche, Amadablam, Thamserku and others. From Namche trip heads to spiritual place of Khumjung called Tengboche. Take blessings from the monks and head to Dingboche. The valley of Dingboche lies in the crossroad of Island Peak Climbing and Everest Base Camp trek trail. Another acclimatization activity is carried out in this place as trekkers climb Nagarshan Hill (5100 m). The tree lines disappear and remains scattered bushes on the trail. The memorial of those who conquered Everest and died intrepidly can be observed. Famous climbers like Babuchhiri, Pasang Lhamu, Scott Fischer, Rob Hall and others remind us the bravery tale of Everest expedition. The trip rests at tranquil hamlet of Lobuche before departing towards Everest Base Camp. Traversing through the moraines trekkers reach Gorakshep at foothill of Kalapathar (5545 m) and after brief stop in one of the lodge we head towards Everest Base Camp. Take as many pictures as possible and leave your footprints on place from where Sir Edmund Hillary and team first embarked on their journey of conquering the Everest for the first time back in 1953. Next morning the majestic sunrise view from Kalapathar would definitely add gloss to this trek. The mountains glowing with sun rays coming out of its casement will dazzle you. The journey then returns back to Lukla for the flight to Kathmandu. Book the Everest Base Camp Trekking package with the experienced team of Mountain Path Treks. We have team of highly qualified mountain guides and Sherpa for the quintessential trekking in Khumbu region of Nepal. Get assured during high altitude trekking with the quality services and impeccable hospitality offered by our trekking crew members. The trail to Gorak Shep goes ahead through the lateral moraine of the Khumbu Glacier. We pass through the pyramid sign post. Ahead on the trail we see crest of north ridge of Everest along with Mt. Pumori, Mt. Mahalangur, Mt. Lingtern, Mt. Khumbutse, Mt. Nuptse, etc. A small ascent would take us to Thangma Riju from where we perceive 360 degree vista of snowy mountains. Climbing steeply up to the top through the torrent of Changri Glacier, we catch our first glimpse of Kala Patthar, a grey-green knoll beneath the Mt. Pumori. As we reach Gorak Shep, we will find snow-capped mountains looming all around us including the top of the world - Mount Everest. After a brief lunch and rest, we take the trail to Everest Base Camp through the once vast Gorak Shep Lake. Continuing straight ahead, we come through the Indian army mountaineers' memorials. Only upon reaching the Everest Base Camp do we really appreciate the Everest climbers who brave the hazardous route through the Khumbu icefall. Mountaineer's tents stand out in bright colors against the monotony of gray surroundings (especially in the Spring). Nuptse, Khumbuste and Pumori are the mountains we can view from the base camp. Everest actually is not visible from here. By now we have met the ultimate objective of our trip. Today is the climax of our trip. We start early in the morning to catch the dramatic views from Kala Patthar and witness the first light of day caress the peaks of the mountains, particularly, Mount Everest. However, we need to be prepared for an early morning departure, amid predawn darkness and cold temperature (-10 to -14 C). Plus there is always the potential for chilly winds which are quite common. Familiar peaks such as Lingtren, Khumbutse, Changtse tower to the east even as Everest begins to reveal itself. During the ascent to Kala Patthar, we can pause to catch breath at several outstanding view points from where you can snap great pictures. After several hours of ascent, we reach Kala Patthar. From here we scramble up to the top of a rocky outcrop marked by cairns and prayer flags. Mind-blowing Himalayan panorama unfolds before your eyes as they wander from one mighty massif to another. You can take as many pictures as you want with your camera but don't forget to imprint the vista in your mind's eye so that it lasts a lifetime. On being back to Gorak Shep, we have breakfast and wait other participants to return.